If you are looking for a rest from the busy city of Luxor or after a long day of sightseeing and new impressions, then our oasis on the West Bank will provide just that. 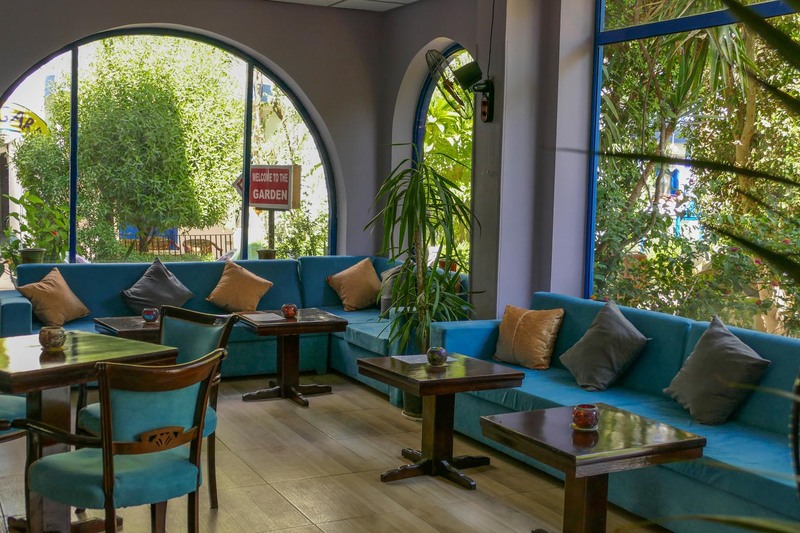 Enjoy your day reading a good book in our new Oriental garden, having a refreshing drink next to the swimming pool, or relaxing on the sun terraces on the roofs of our apartment complex. 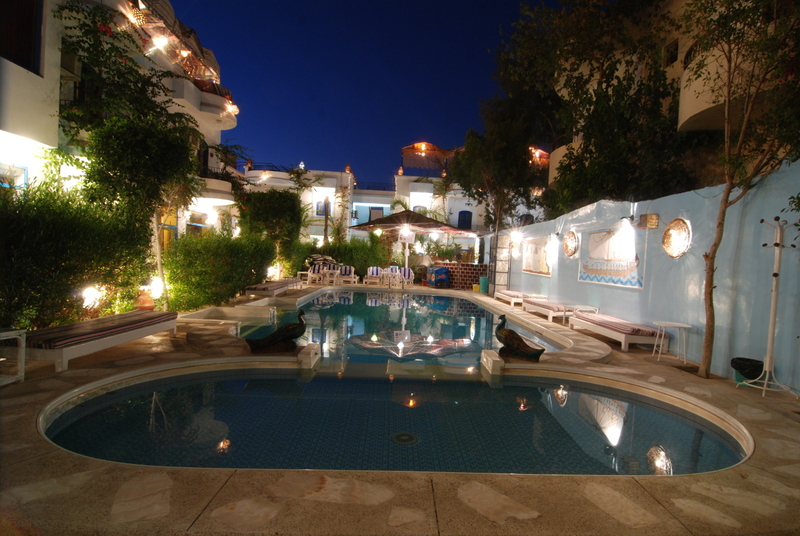 You will be rewarded with a spectacular sunset over the western mountains. 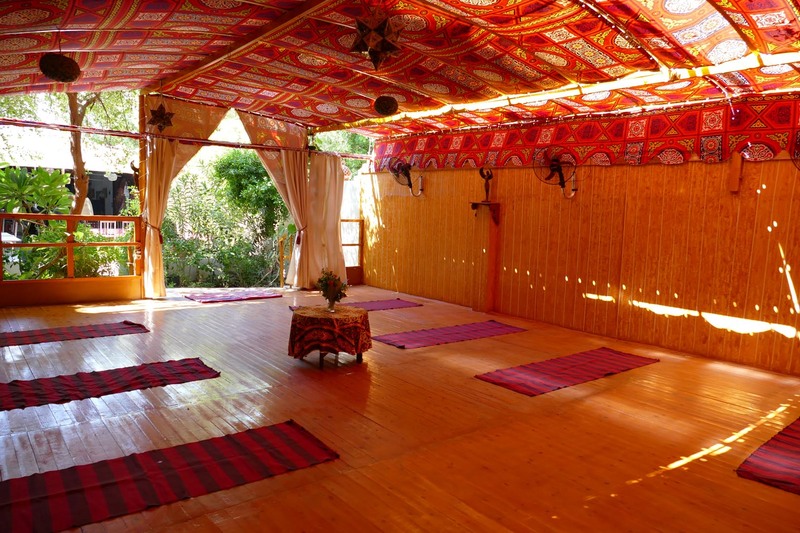 In the Oriental Garden we invite you in our “Isis-Temple” to practice Yoga or Meditation. Surrounded by trees and citrus fruits, it´s the perfect place to find tranquillity and relaxation. 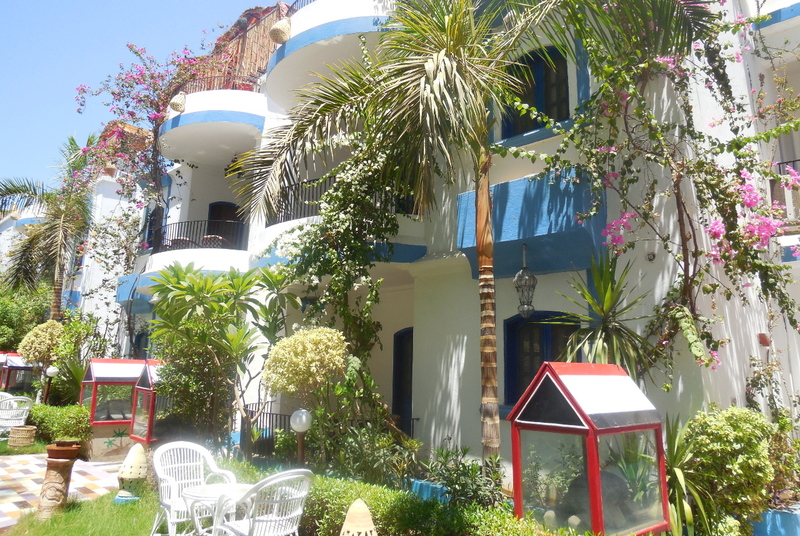 Gezira Gardens consists of 8 apartments and 16 double rooms, all with ensuite bathrooms. 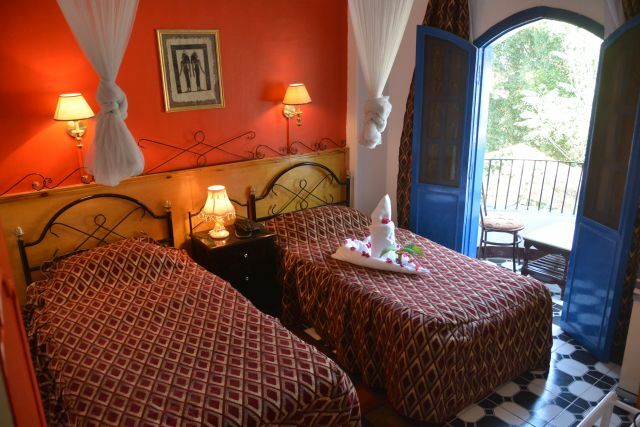 One bedroom has two single beds, the other has a double bed. 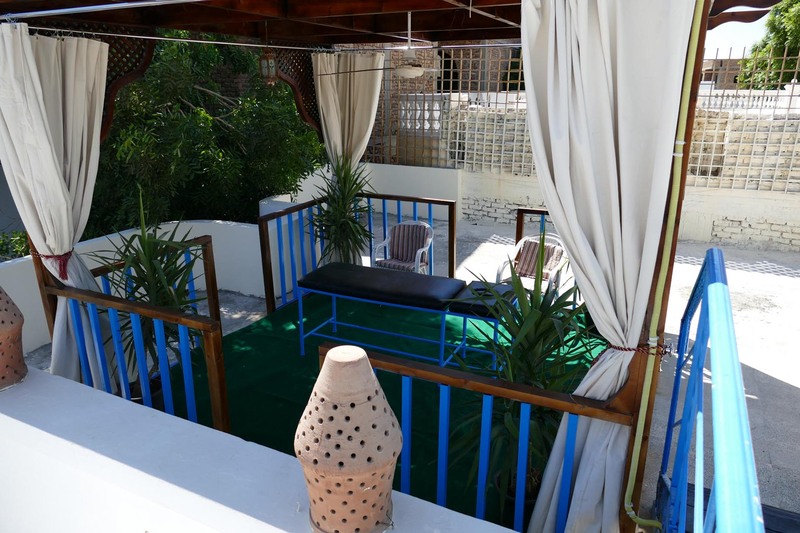 Each bedroom has a balcony which overlooks the garden of the hotel. The back window has a spectacular view across the fertile Nile valley to the mountains behind. 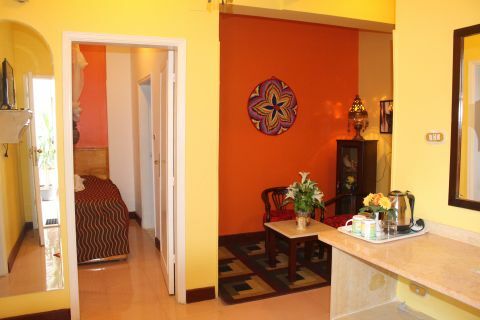 The apartments can accommodate four (4) adults, or two (2) adults and two (2) children. 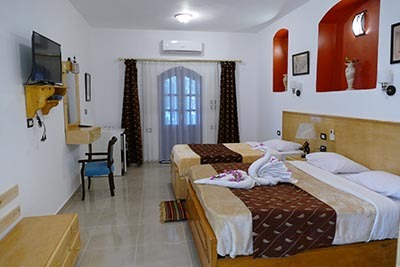 All rooms and apartments are equipped with satellite-tv, telephone and air condition unit, refrigerator and free Wi-Fi. 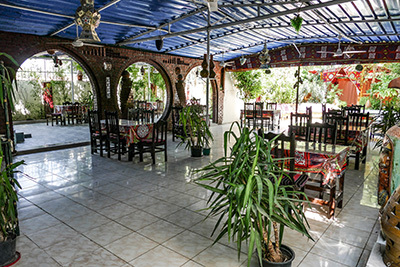 Gezira Gardens restaurant, bar and roof garden is located in the new hotel complex. 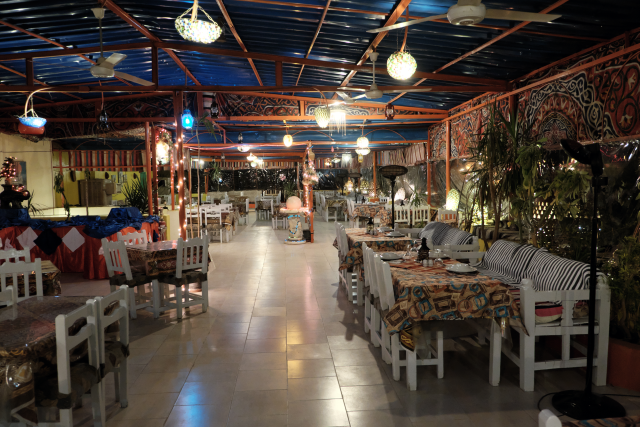 After a busy day, you can enjoy a traditional Egyptian dinner or international dishes and savour a fine bottle of Egyptian wine. 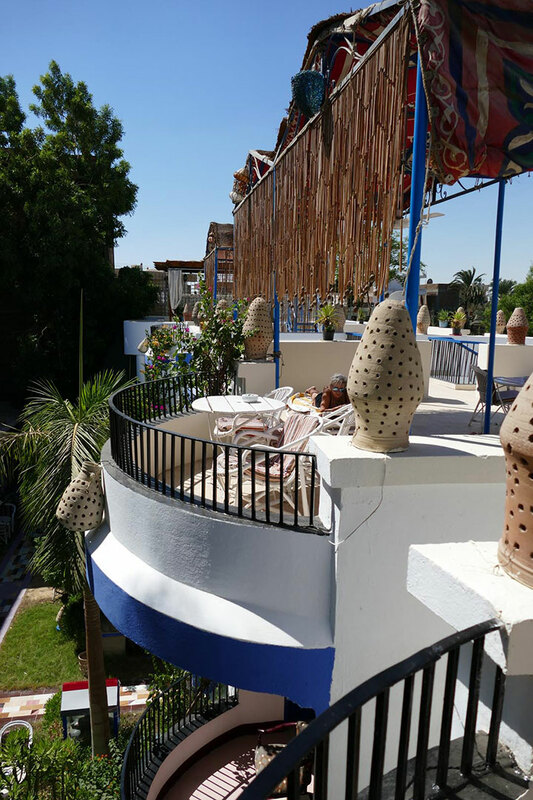 You are welcome to visit Hotel Gezira's stunning roof terrace. 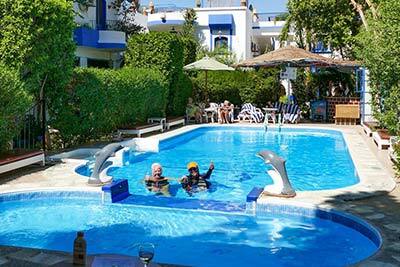 The vacation complex has an Oriental garden, a swimming-pool and facilities for billiard. 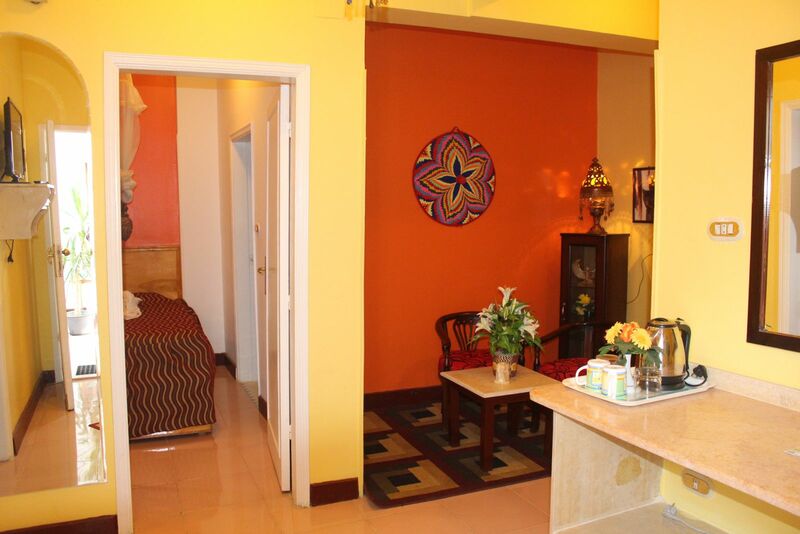 We also offer laundry service (for a small cost). The distance from Gezira Gardens to the Nile is about a three minute walk. 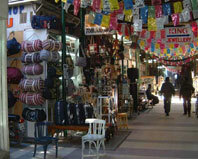 Small supermarkets and shops are nearby. 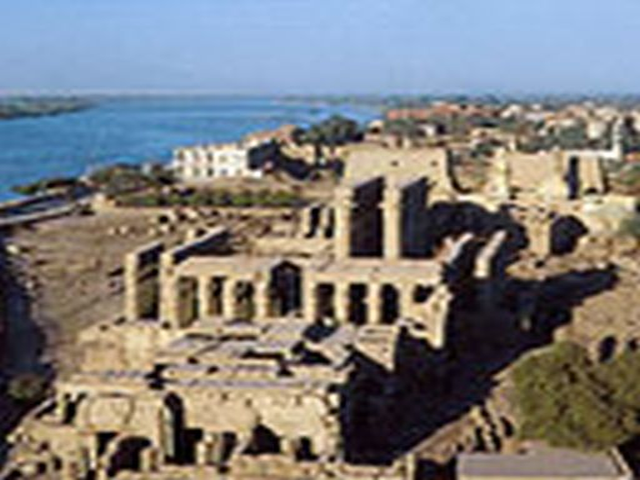 Historic Thebes (Luxor) was one of the most important cities of the ancient world. 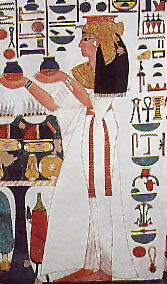 During the "New Dynasty" Thebes was the centre of Egyptian culture. Today we marvel at the largest of all of Egypt's temple complex located on the East Bank. The West Bank leads us to the gigantic burial grounds of "Necropolis". Luxor is a city filled with ancient and modem charms, international hotels, cafes, villages, farms, markets and bazaars. Experience Middle Eastern hospitality and a fascinating way of life. 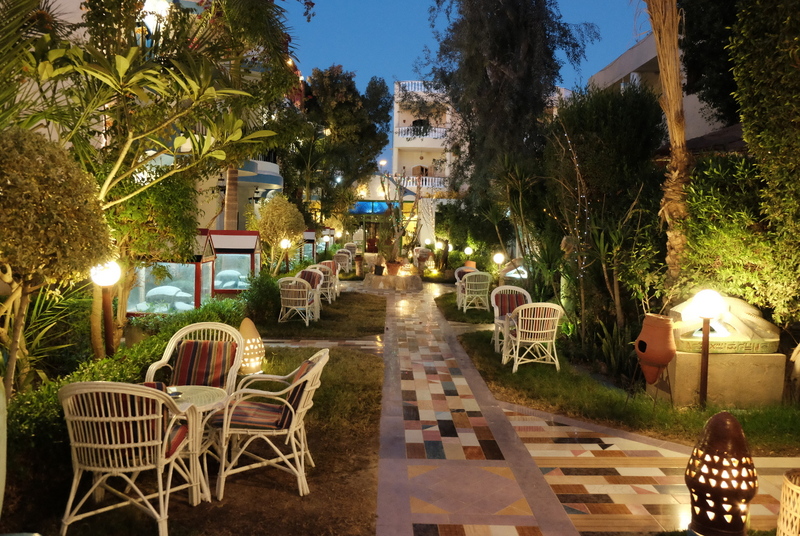 Central Luxor is located on the "East Bank" and is approximately 600 km away from Cairo. 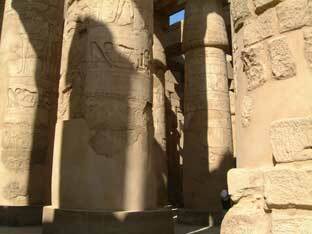 Just North of Luxor is one of the most impressive temple complexes in the world: Karnak. 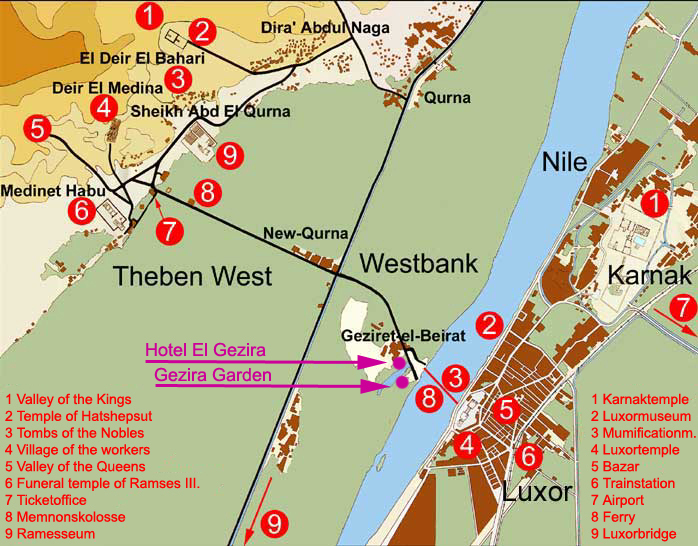 The West Bank region of the Nile, also known as Thebes West, is mainly agrarian and consists of many villages. 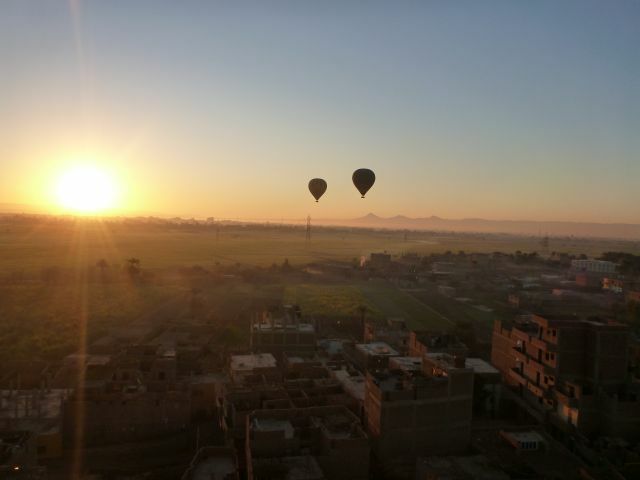 The airport is located about 8 km East of Luxor. 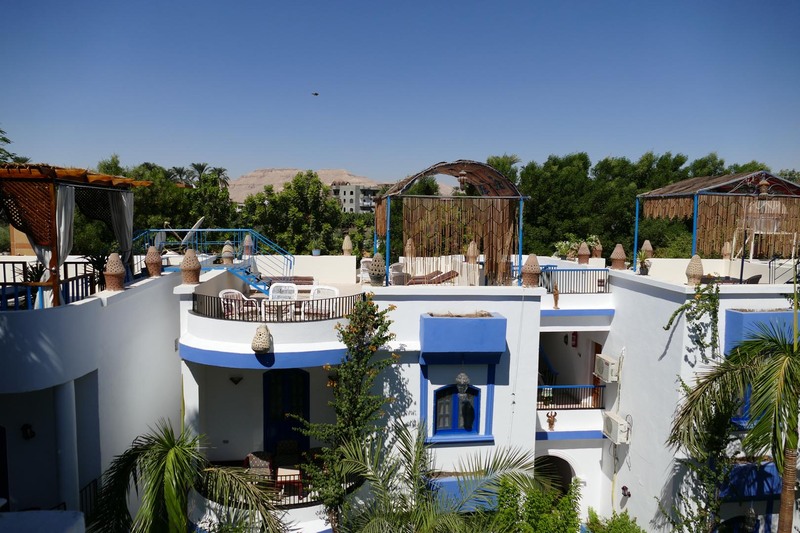 The Hotel El-Gezira can be approached by either crossing the river Nile with the local ferry or by one of the little motorboats available or driving over the Luxor bridge about 5 km from Luxor centre. 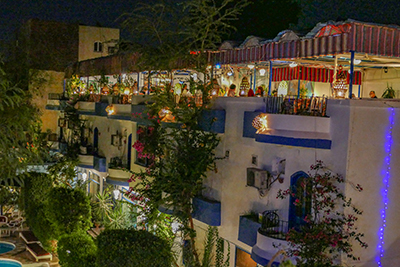 The railway station is at the centre of Luxor town, from where the river Nile is quickly approached. 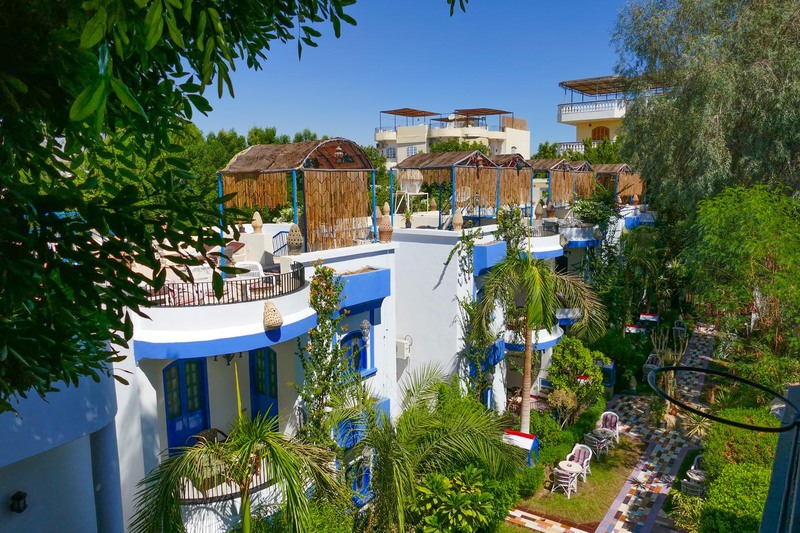 The best time to visit Egypt is the winter season. 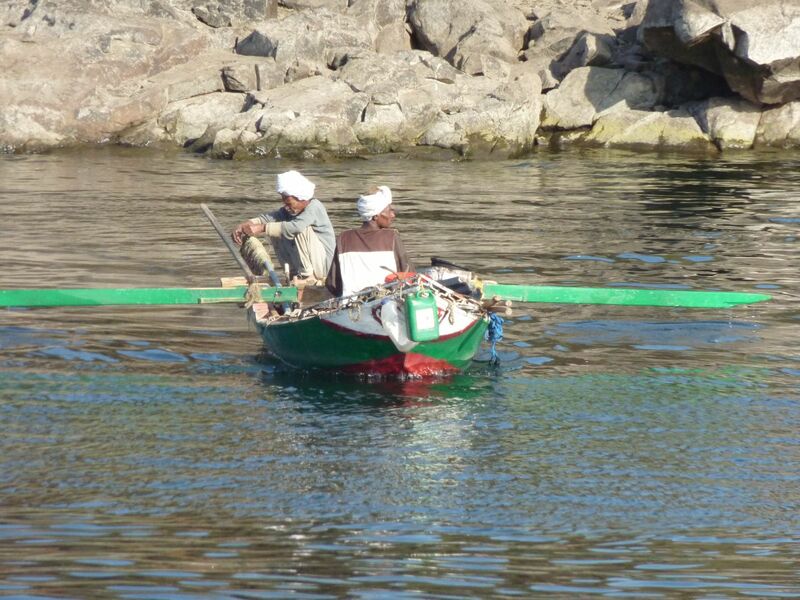 Egypt is located in north-eastern Africa, with the Sinai peninsula extending into Asia. Egypt serves as a cultural and physical bridge between Africa and Asia, Red sea and Mediterranean, Islam and Christianity. Egypt shares its borders with three neighbours, Israel to the Northeast, Sudan to the South and Libya to the West. The flight distance from London to Cairo is approx. 3510 Km. Egypt consists of over 95% uninhabited desert. Most of Egypt is located in the Sahara desert, with the exception of the Sinai peninsula and the Mediterranean coast. The Nile valley is the longest river oasis in the world. 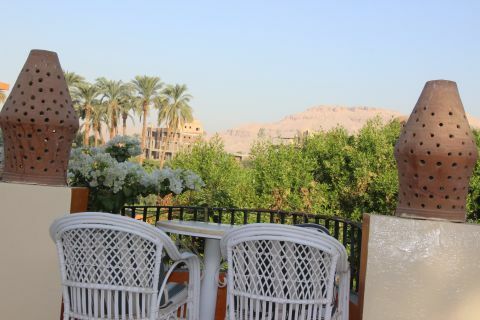 The majority of Egypt's 90 million inhabitants, 20 million of whom are in Cairo, live in this valley. With the exception of the coastal areas, the climate of Egypt is arid. Precipitation in the South is much more sparse than in the North e.g. Alexandria with 191mm, Cairo with 24mm and Aswan with less than 1mm per year. 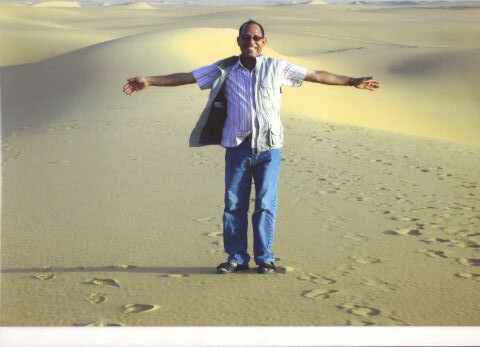 The soil of the Nile valley contrasts strongly with that of the nearby desert. The ancient Egyptians used the terms "Black land" and "Red land" to describe these various zones. 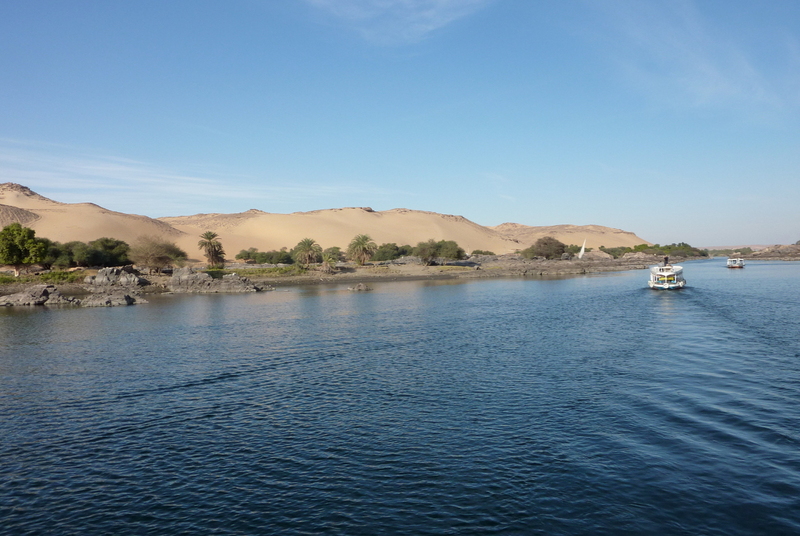 The dark Nile silt deposit is unto 10 meters thick and extremely fertile. 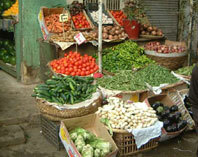 In spite of industrialization, Egypt has remained a largely agrarian based country. The majority of the farming methods have remained unchanged for centuries. A complex system of irrigation allows farmers multiple harvests per year. The typical winter crops are wheat, barley, beans and onions. The typical summer crops are rice, sugar cane and cotton. 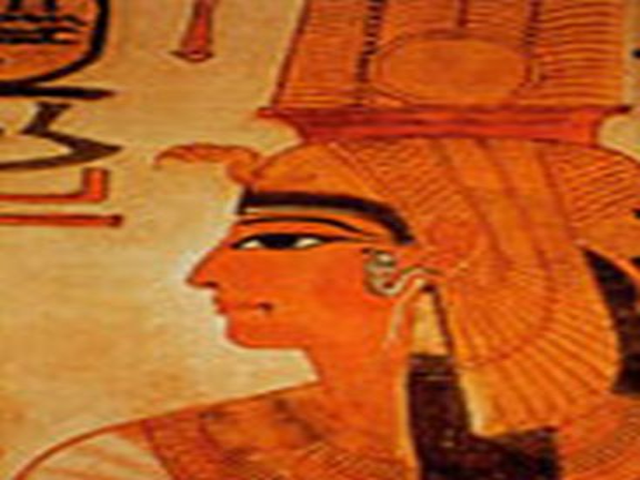 About 85% of the present population are descendants of the ancient Egyptians. 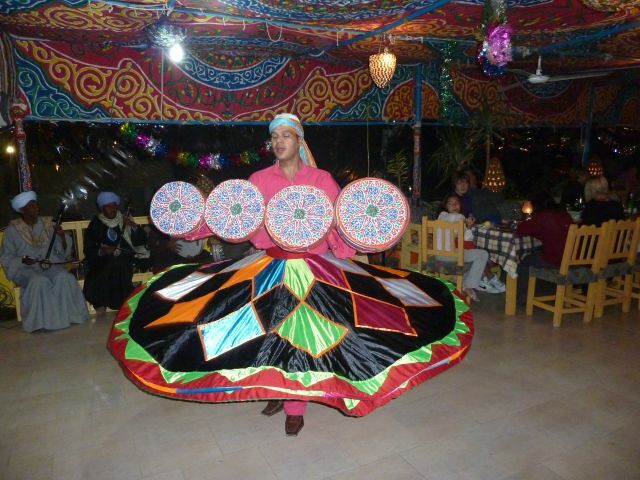 The Egyptians belong to an ethnic group of the Berbers and are not Arabs. The Arabs, who conquered Egypt referred to the local people as "fellahs" (arb. 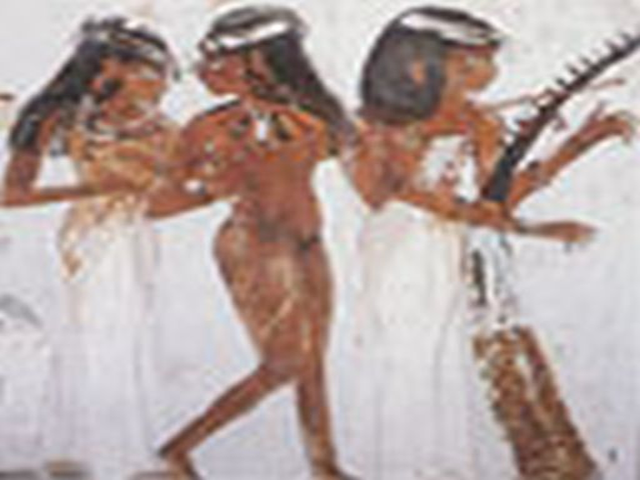 Felah= field work), The most intact elements of the ancient Egyptian features are to be found in the Coptic Christian minority, which represent about 7% of the population. After the "Holy War of the Arabs" Islam was established as the dominant religion. 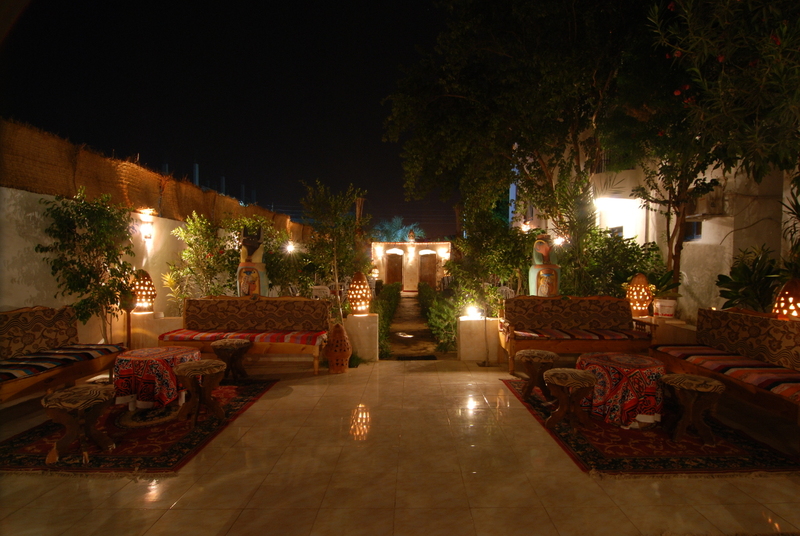 About 80.000 Bedouins cling to their traditional way of life as desert nomads. 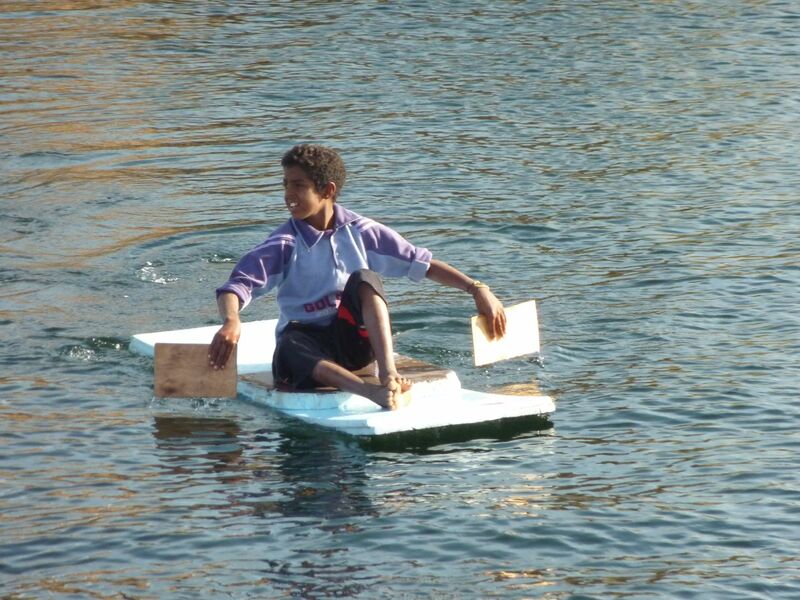 Nubians from Sudan, displaced by the flooded Nasser lake region, also make up a part of Egypt's population. 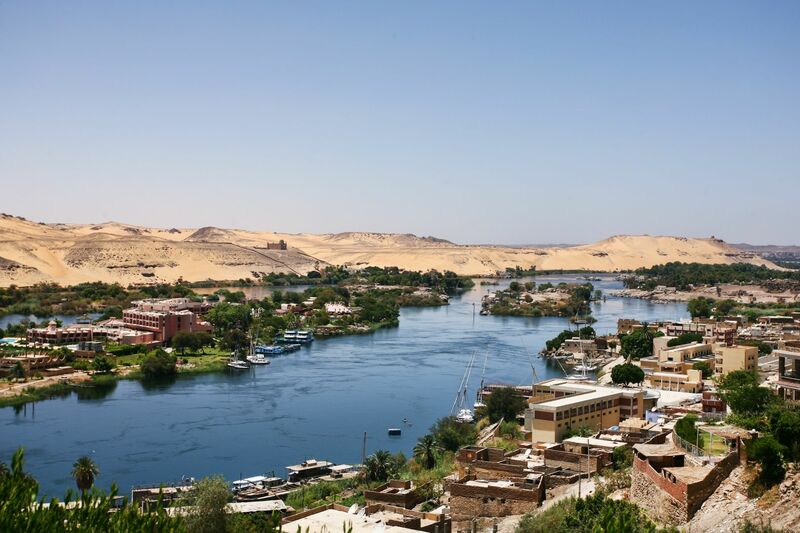 Daily life in the ancient world, but above all, the worship of the Gods, took place at the east side of the Nile. The west side was reserved for the dead and the all-dominant death cult as the day was “born” in the East and “died” in the West. 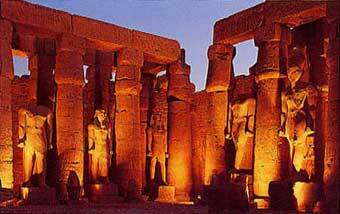 The Luxor temple was built in the New Kingdom by Amenhote III. and Ramesses II. 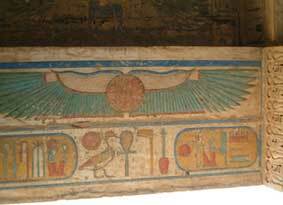 to honor the holy triad of Amun, Mut and Chons. 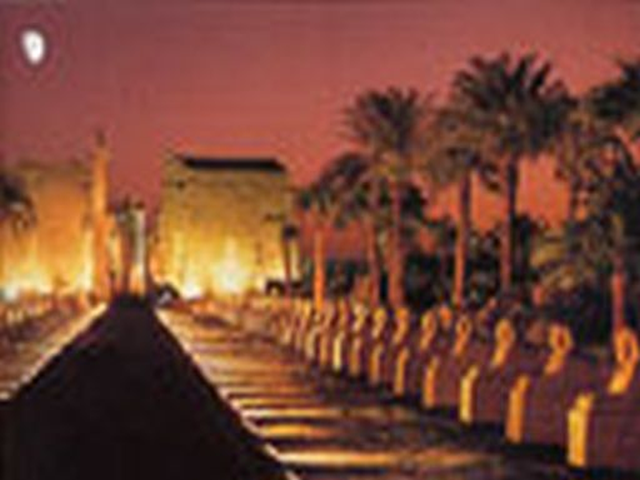 The Luxor temple and the great Amun temple at Karnak were connected by a 3 km long procession road. 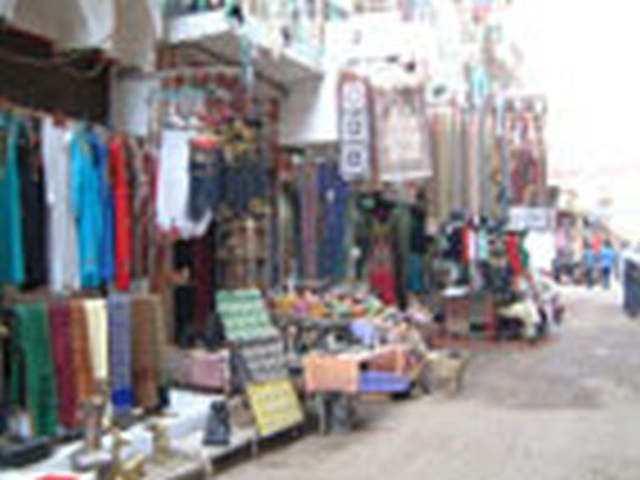 Annual processions were held on this road. 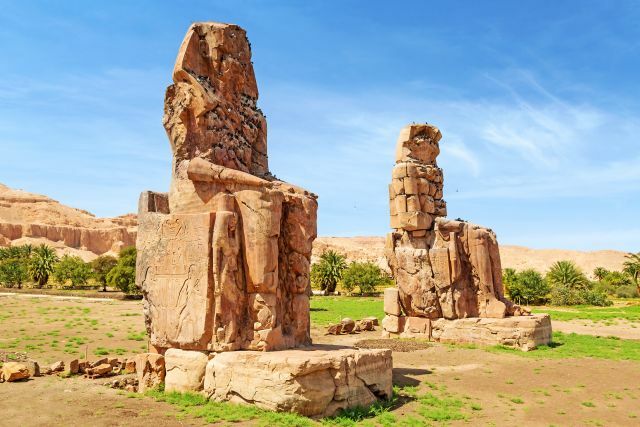 The six colossal statues of Ramses, which once stood in front of the pylons, are no longer there. Two seated statues and a standing portrait of Ramses are all that remain. 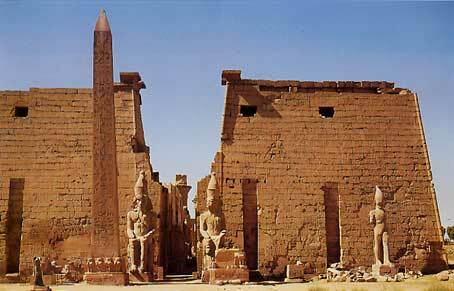 Originally two obelisks stood in front of the temple. The smaller of the two was given to France as a gift and is now at the place de la Concorde in Paris. Expect to spend at least 2hrs to see Luxor temple. 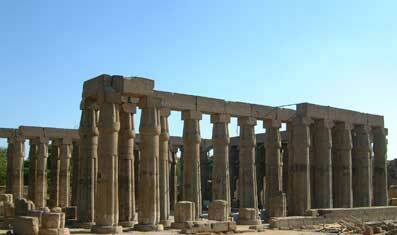 The temple of Karnak is actually a temple city. 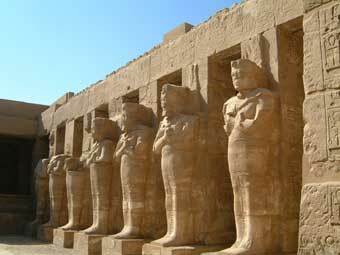 Today, as well as in ancient times Karnak is the largest and most important temple complex in Egypt. 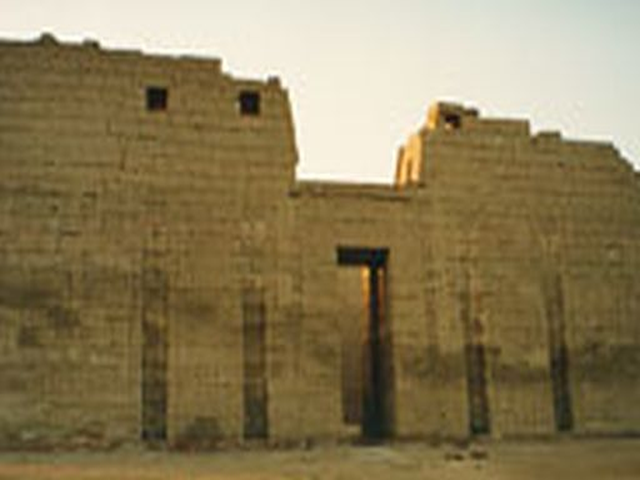 Building of the complex began during the early part of the Middle Kingdom. 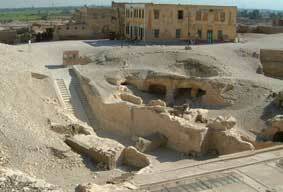 In the following 2.000 years the complex was under constant construction. The history of Thebes is closely associated with this complex. 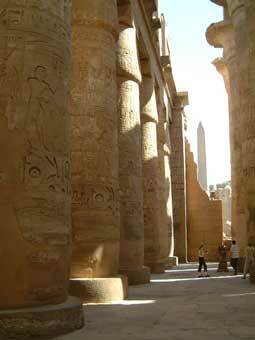 In the center of Karnak is the great temple of Amun with it's six pylons make up the most important part of the temple complex. The pylons begin in the so-called great court and lead to the great hall of columns. 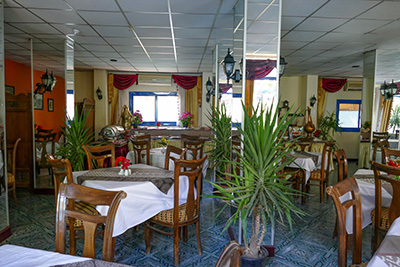 Covering an area of 5.000 sq. meters, with 134 ca. 24 meter high, carved and painted stylized papyrus columns, this enormous sacred complex was in ancient times considered a wonder. Passing the six pylons you reach the holy alter, where the statues of gods were kept. 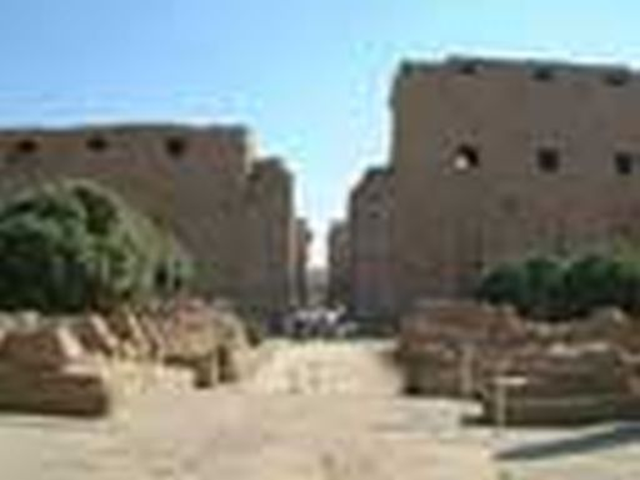 Other temples composed the East gate, which made up the end of the complex. Before this gate stood the ca. 30 meter high Lateran obelisk, which is now in Rome. 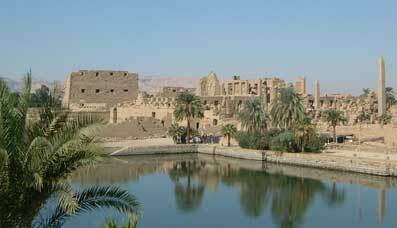 Karnak is about 3km North of Luxor. It can be comfortably reached by horse and carriage. 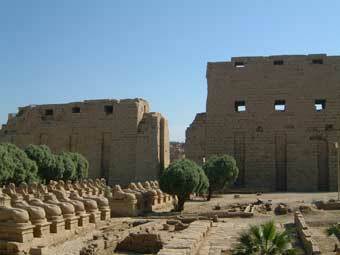 Expect to spend about 4hrs to see all of Karnak. 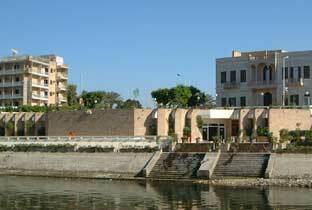 In 1975 a museum was opened on the Nile promenade(Corniche). The museum does a wonderful job of displaying historic artifacts and works of art discovered in Thebes and the region. The museum opens after noon. For exact times please contact us. Expect to spend at least 1-2 hrs. 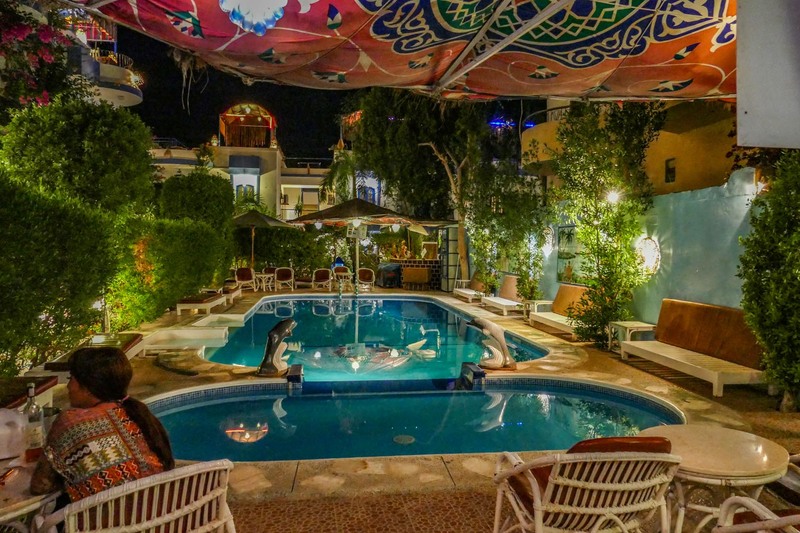 to visit the Luxor museum. Direct on the Nile promenade (Corniche) near the Luxor temple is the museum of mummification. 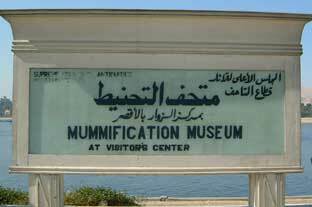 The museum is dedicated to the ancient Egyptian science of mummification and has a fine collection of human and animal mummies. "Sound and Light" is a show you won't want to miss! 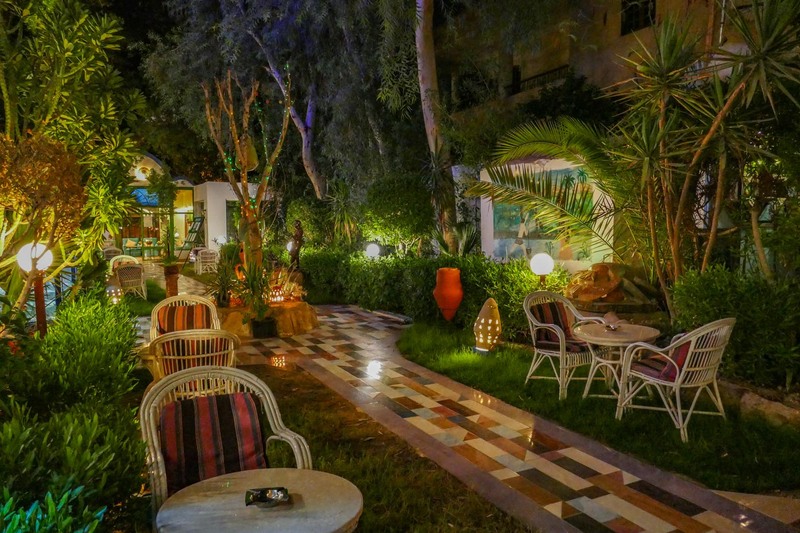 Allow yourself to be swept away by this light and audio extravaganza at Karnak. "Sound and Light" is a 1hr. Show. 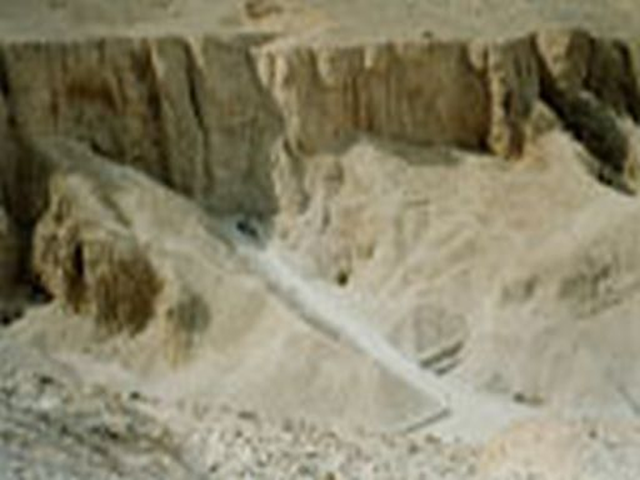 The "Valley of the Kings" runs directly into a mountain range near Thebes, where a mountain peak forms a natural pyramid. 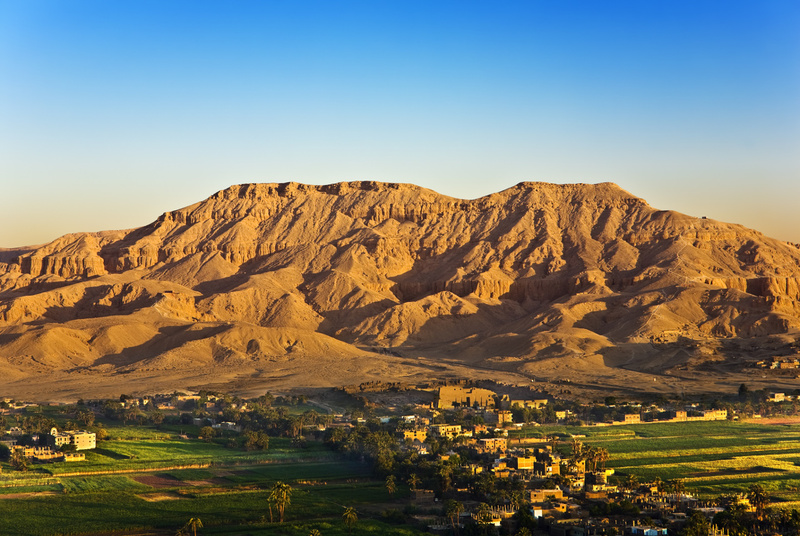 The valley derives ifs name from the stunning carved tombs of the pharaohs of the 18th,19th and 20th dynasty. These royal tombs, some carved some 200 meters into the mountain, consist of side chambers, niches, connecting tunnels and a burial chamber. 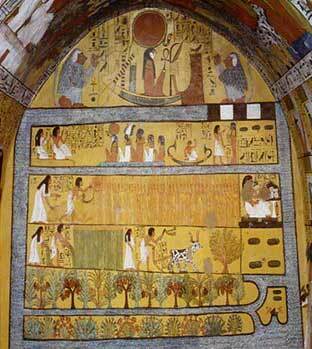 The walls are decorated with scenes from the book of the dead. These scenes portray joy and suffering in the after life. 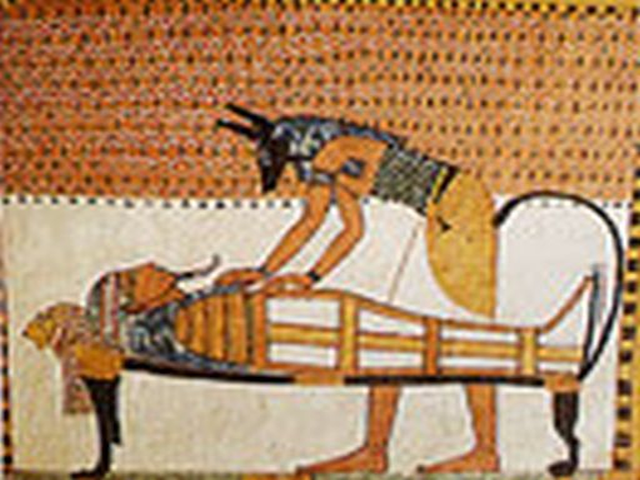 The belief in an after life drove the ancient Egyptians to go to great lengths to ensure themselves a comfortable after life. 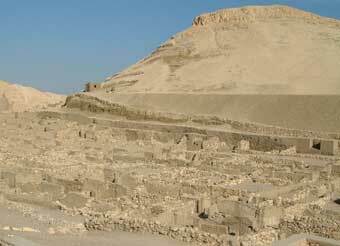 As counterpart to their tombs a funeral temple played an important and necessary part of the preparation and fulfillment of the after life. 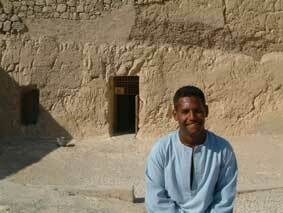 These funeral temples are usually several kilometers from the tomb and located in the Nile valley. 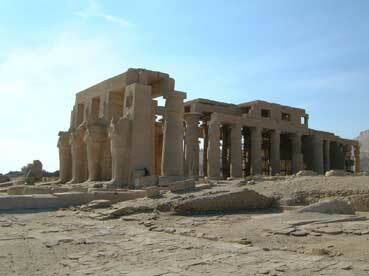 The best examples are the temple of Ramesses II. 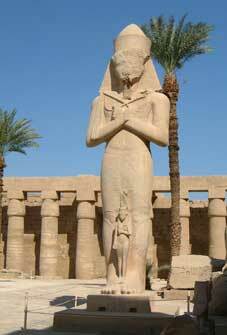 (Ramesseum), Ramesses III. 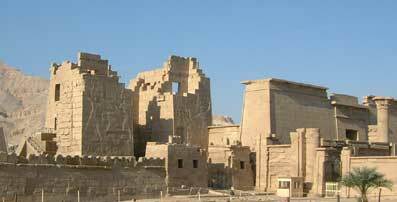 (Medinet Habu) and that of Hatshepsut (Deir el-Bahari). We can only imagine the great treasures, which were meant to accompany these great kings in the after life. The discovery of the tomb of the rather unimportant king. 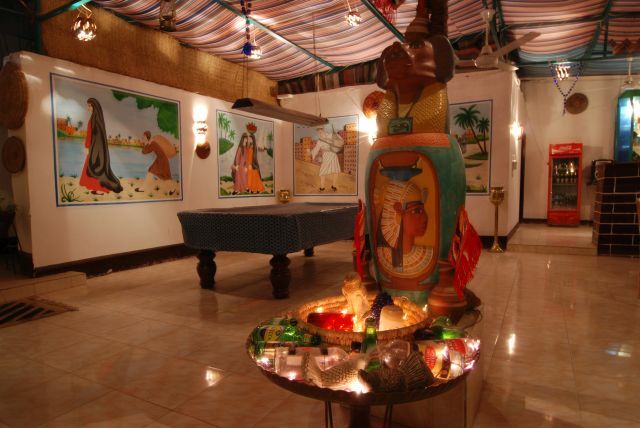 Tutankamun gives us a small hint as to the treasures, which were to be enjoyed by the pharaohs in the after life. 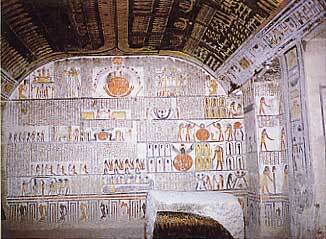 Most of these tombs were opened and plundered in ancient times, leaving only the royal mummy. In the 19th century an archeologist discovered a tomb, where many of these royal mummies had been moved and collectively buried. These royal mummies can be seen at the Egyptian museum in Cairo. 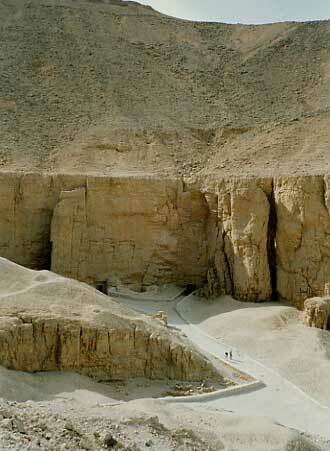 The mummy of King Tutankamun is in the Valley of the Kings where it was laid to rest some 3.000 years ago. Thutmose III. (Nr.34), Amenophis II. 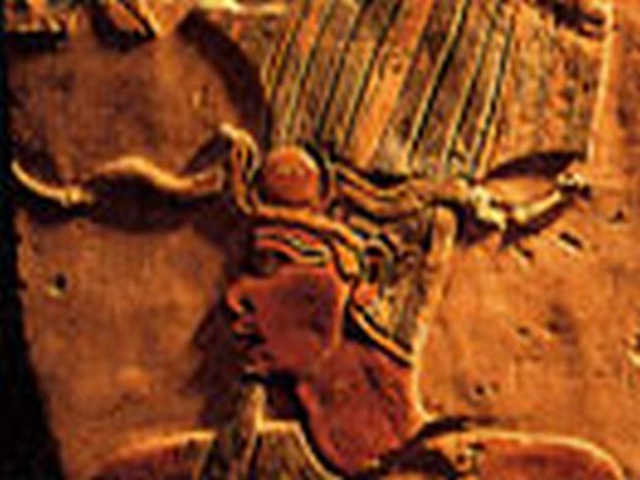 (Nr.35), Tutankhamun (Nr.62), Horemheb Nr.57), Ramesses I. 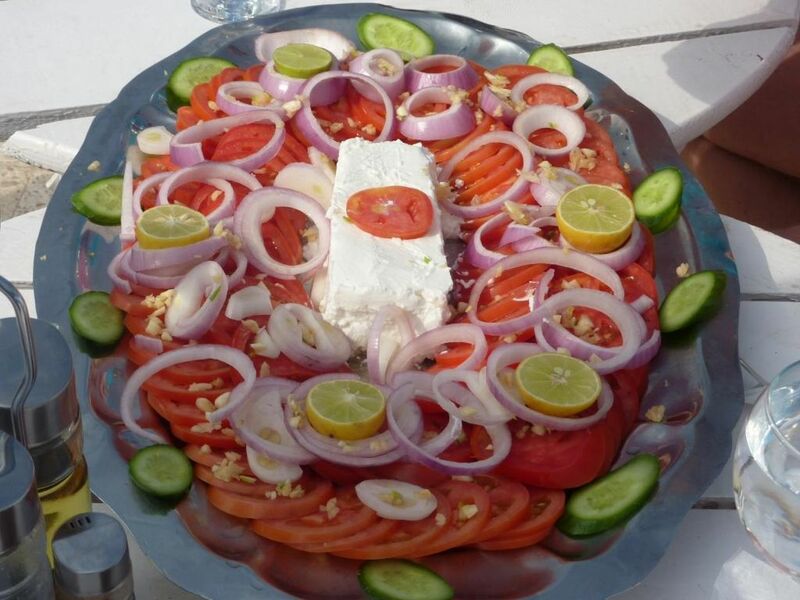 (Nr.l6), Sethos I. (Nr. 17), Merenptah (Nr.8), Ramesses III. (Nr. 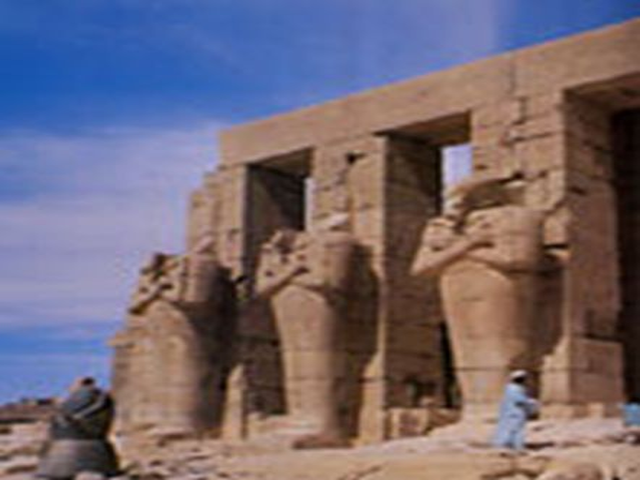 11), RamessesVI (Nr.9) and Ramesses IX (Nr.6). Expect to spend about 4-5 hrs. 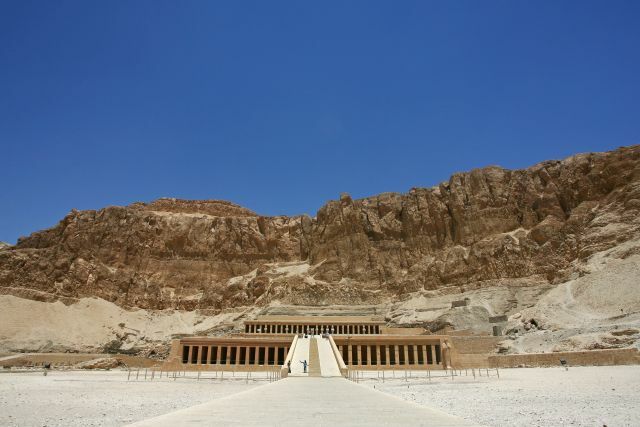 to visit the Valley of the Kings. 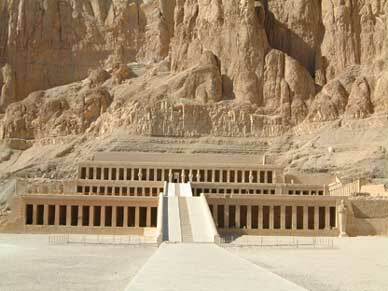 Queen Hatshepsut is probably the most famous of all the women who ever rose to the throne to become Pharaoh. 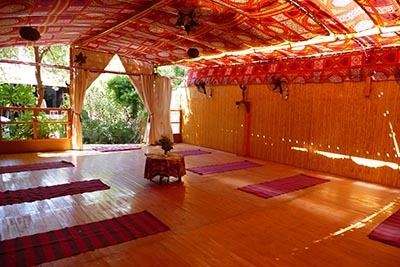 Her funeral temple is one of a kind and very well preserved. 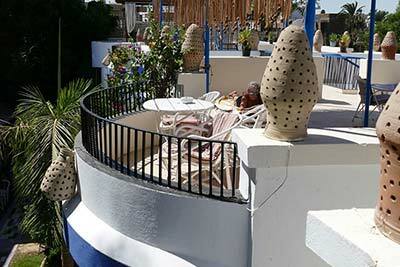 lt is at the foot of a 300 meter high cliff and consists of three terraces connected with ramps. Ramses II. erected a temple for the supreme god Amun of the edge of the fertile Nile valley. 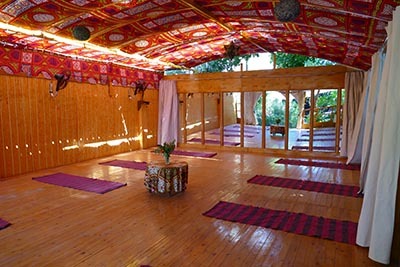 This temple, like many others, was misused as a quarry since ancient times. Only about 50% of the temple is still in existence. 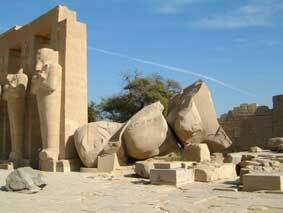 The fallen colossal statue of Ramses II. is impressive. 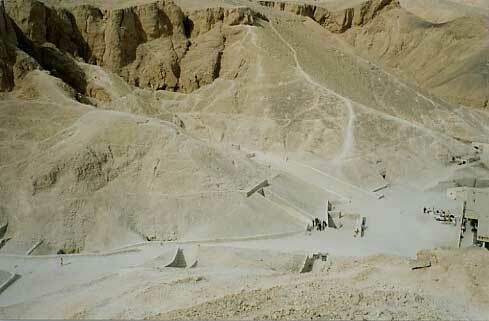 In a small canyon leading to the Valley of the Queens are the ruins of a small city. 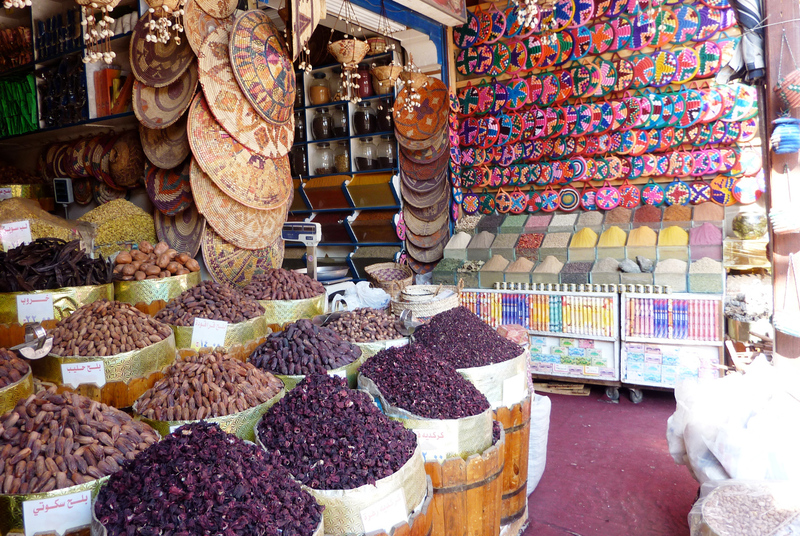 This city was reserved for the artisans, who built these fantastic tombs. The work they did was secret and here they were isolated from the rest of the population for the rest of their lives. Some of the artisan built tombs for themselves. The tomb of Sennodjen is probably the most beautiful of these tombs.The tomb is rather small,but is wonderfully painted and should not be missed. 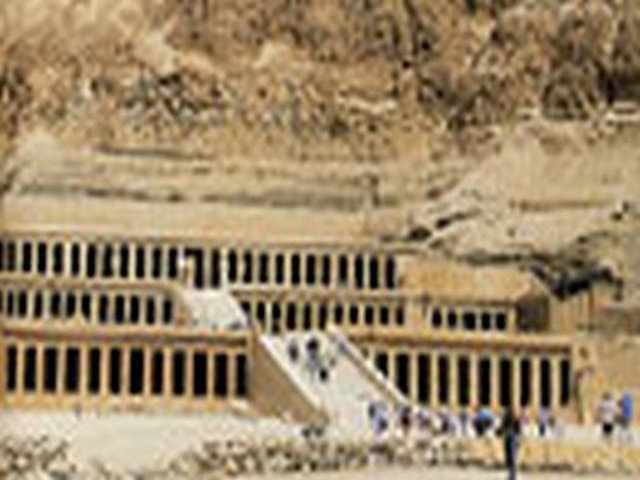 About 80 tombs belonging to members of the royal family have been discovered. 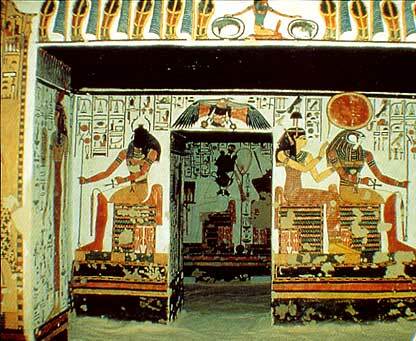 In spite of their royal status, many of these tombs are very simple.The tomb of Nofretari, the favorite queen of Ramesses II. is the exception. This tomb took years to restore it to it's lavish original condition. 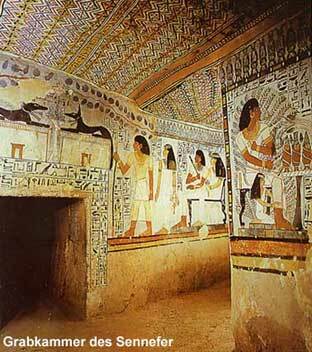 This exquisite tomb is one of the climax of Thebes West We highly recommend visiting this site. 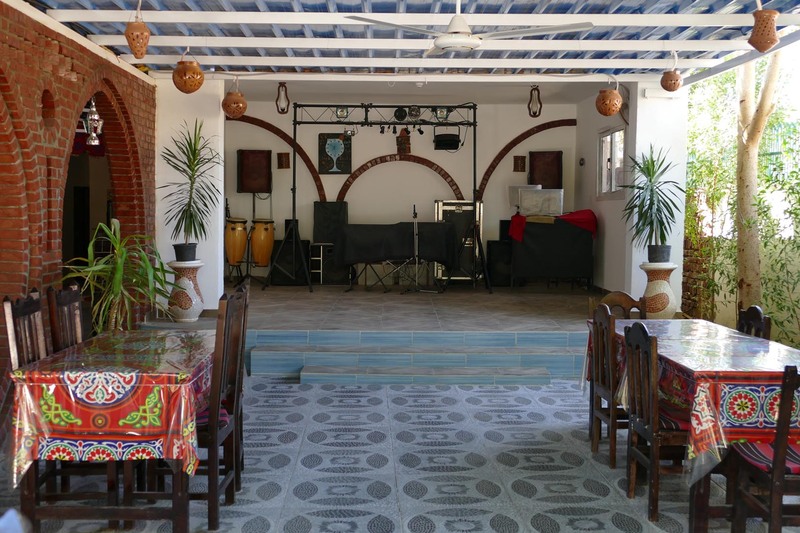 Be sure to inquire about all rules and restrictions before visiting this site. 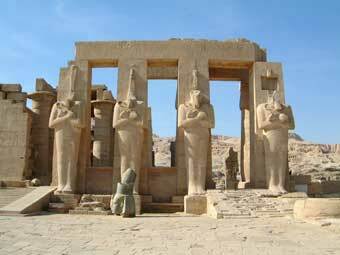 The funeral temple of Ramses III. 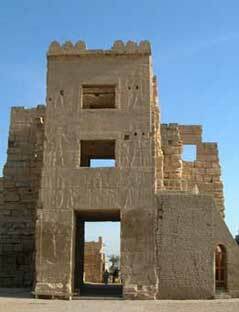 Another well preserved temple complex in Teben West. It probably the most complete complex. 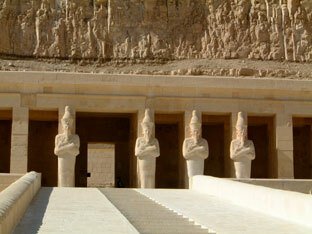 The temple is decorated with amazing wall reliefs depicting various pharaohs and their victories over foreign nations. Remnants of the original paint can still be seen today. 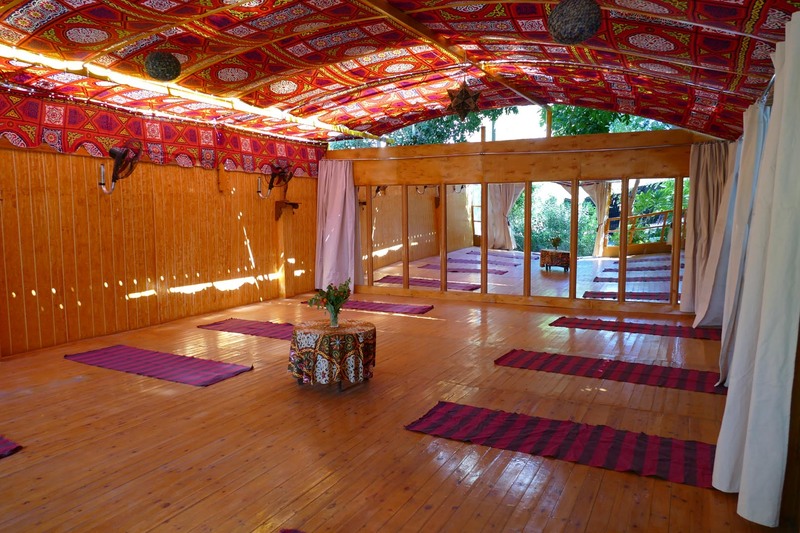 We highly recommend visiting this temple. Would you like some assistance with your sightseeing agenda? We can help to optimise your excursion plans. 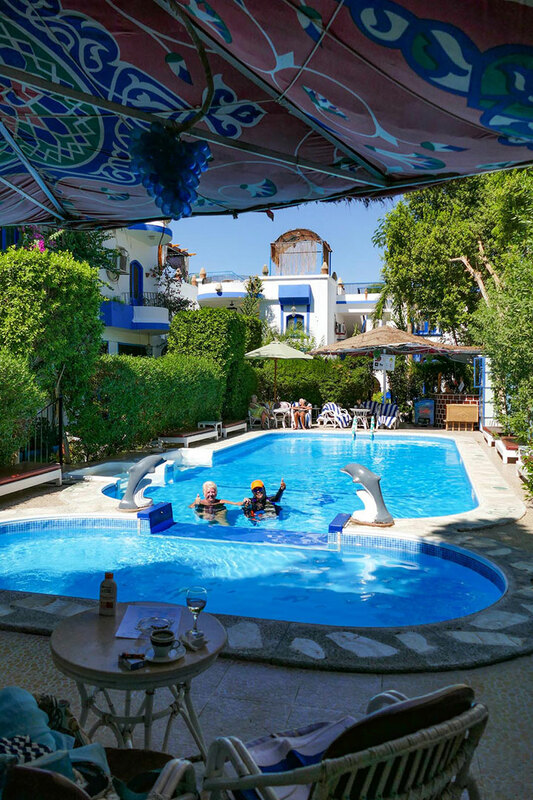 We can provide you with multilingual, licensed tour-guides who can provide you with an individual tour of the historic and everyday treasures of the region. Trips outside of Luxor can also be arranged. 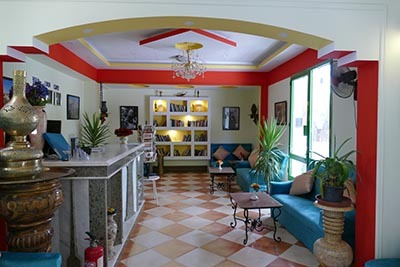 Would you like to visit our museums? 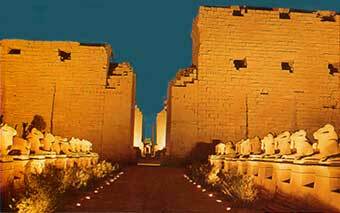 Would you like to see the awesome sound & light show in Karnak Temple? 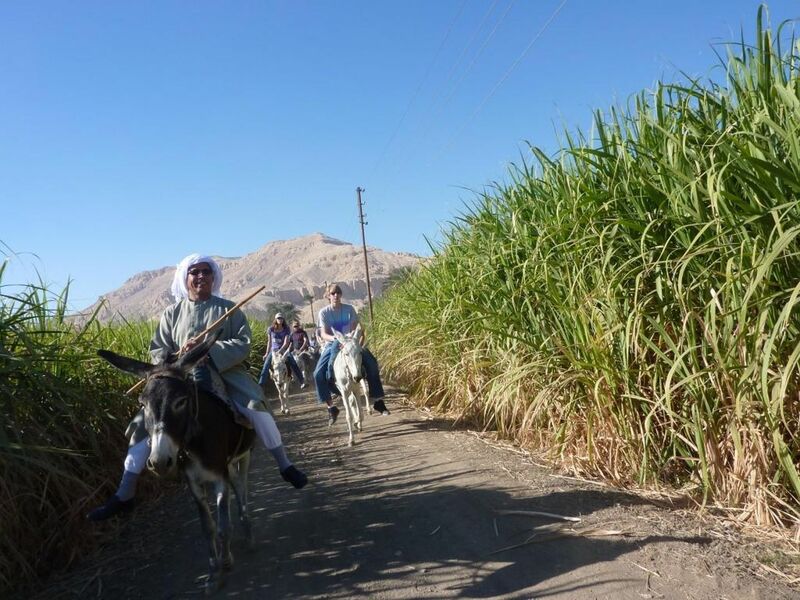 Would you like to explore the fertile Nile valley by bicycle or donkey? 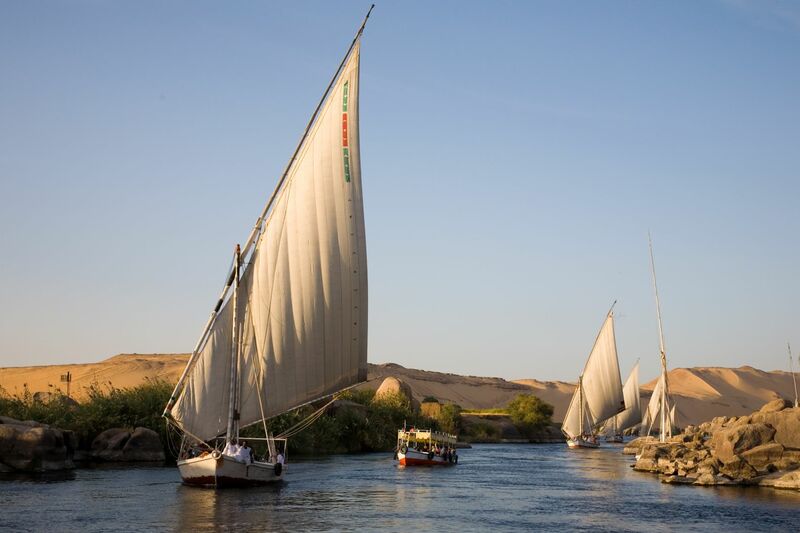 Or perhaps you would like to visit Banana Island, experiencing a lovely sunset in an Egyptian Felucca on the way? We can organise all of this for you. And please enjoy the free use of our swimming pool in Gezira Garden Hotel, a 5minutes walk from Hotel El Gezira. Admission fee for non-hotel-guests is only EGP 20. 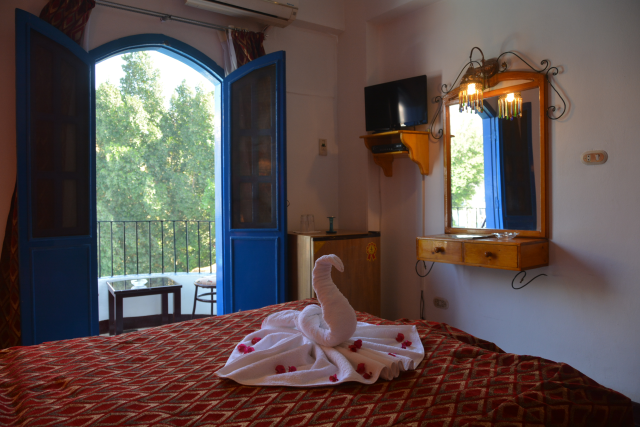 All room rates are per room per night, all prices including taxes. 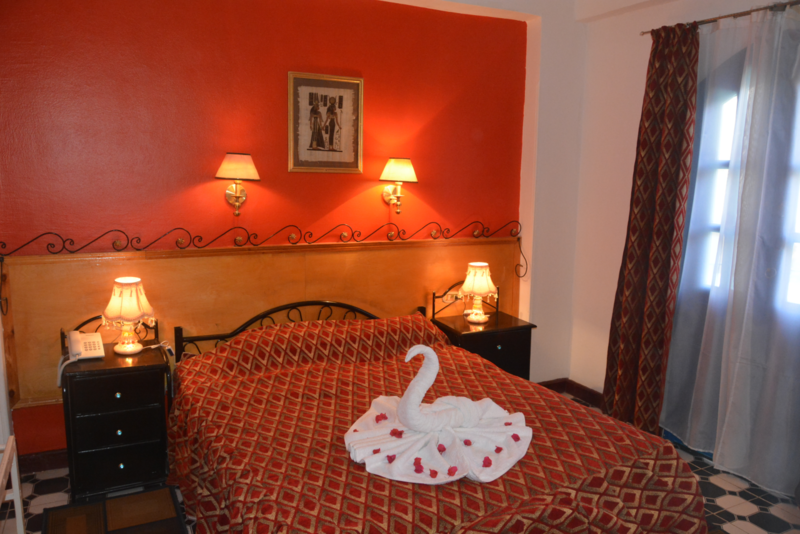 All room rates are per night including taxes.